From 1983 to 1984, he joined the Embry-Riddle Aeronautical University, in Florida but he didn’t cut through. He gave it up and started his auto racing career and followed his passion. Then in 1986 to 1987, Matt joined University of Maryland College Park for a course in Architecture and Psychology. Matt owns several businesses such as Matt Connolly Motorsport and victory run investment, both of which were founded in 1994, in Bethlehem Pennsylvanian USA. His other achievements include being an auto race champion, and he was also a US Congress nominee in January 2014. His endeavors in business and his love for policy creation have provided him with a circle of professionals and experts in various fields. He has had a long-term passion seeking out new innovations and investing in them. Government over-regulation and pressing tax policies are constantly burdening people and the Blockchain technology offers the perfect solution to this. For the first time in history, the users of the financial services can get involved in a self-regulating decentralized system. 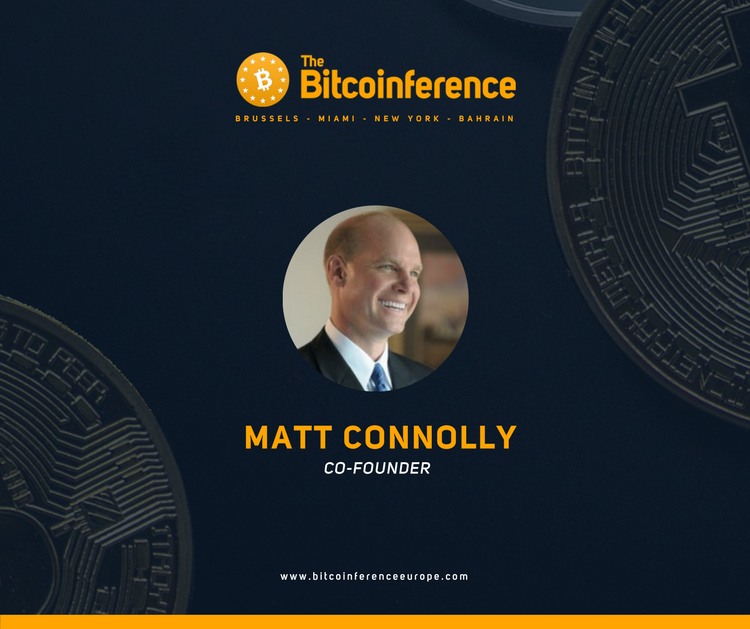 The empowerment that the Blockchain offers is what drives Matt to be part of it and to get as many people as possible involved also. Since 2010, he developed an interest in digital currency and devoted his time to follow it closely. He saw the potential in it to drive financial change for the better. Being a successful business owner and the experience he has gained, serves as an advantage in unveiling the technical and practical world of Blockchain technology. By observing the current trends in the financial industry, it is evident that the change of behavior in finance is inevitable. That’s why the organizers of the conference decided to hold an event to discuss the future of currencies that is scheduled to take place on 1st June in 2018 Brussels, Belgium. Over 500 attendees are expected to be present at the event. On the main stage, there will be six startups who will launch their startups this year and 12 renowned speakers on the issue of Finance and Cryptocurrency. During the events, the six startups will be presented with a chance to sell their idea. Voting will take place democratically whereby the High Potential Startups will be rewarded. People attending the event will get a front seat opportunity to learn about the current changes and advancement in Cryptocurrency and Blockchain technology. Most importantly, they will get to know how they can apply the knowledge to take their businesses to the next level. Book your spot so that you too can get the opportunity to discuss and learn about the prospective future of finance. See you soon in Zug, Switzerland!